Enclosure heaters, or cabinet heaters, are used to warm the air inside electrical devices and to regulate the internal conditions of your device. They are used in a variety of devices, most commonly heaters and 3D printers. 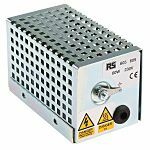 Enclosure heaters are designed to help electric, electronic, pneumatic, hydraulic and mechanical equipment to perform at its best by protecting against low temperatures, condensation and corrosion. They do this by providing an evenly distributed interior air temperature. Why are enclosure heaters important? By keeping the internal temperature of a device as little as five degrees higher than the ambient temperature, the risk of condensation can be eliminated. The warmer the air, the more water vapour it can contain. When air is cooled it can no longer hold the water vapour and reaches its dew point – this is where condensation arises. It's important to avoid the presence of condensation in your device as this can cause it to fail or become damaged.